The Wayne County Community College Downriver District Campus and the School of Continuing Education will present a Back to School Rally from 11 a.m. until 2 p.m. Monday, August 24, at the WCCCD Campus, 21000 Northline Road. The rally will feature youth and parenting workshops, vendors, community resources, dental education, giveaways, entertainment and more. Free backpacks, school supplies and food will be available (while they last). For more information, call (313) 496-2704 or click on www.wcccd.edu. The Democratic Club of Taylor will hold its 70th Annual Corn Roast on Saturday, August 22. It is open until 6 p.m. Good food, children's activities and entertainment. The public is welcome. The club is located at 23400 Wick Road. Call (313) 291-8060 for information. Get ready, kids. A new splash pad is on the way to Heritage Park! The City Council on Tuesday, August 18 approved funding for the next phase of the Sheridan Center Open Air Pavilion project and dedicated the planned new splash pad to the late Mayor Jeffrey Lamarand. Councilman Alex Garza read the proclamation that dedicated the planned new facility to Mr. Lamarand, who died last October at the age of 45. His wife Mishelle, daughter Jillian and son Nash attended the council meeting, as well as other family and friends. It was late mayor who originally started the Sheridan project. Under his administration, the former recreation center and indoor hockey rink was renovated into an open air pavilion during the first phase of the project, which ended in June 2014. The open air pavilion has been used for summer festival concerts, special gatherings like the opening ceremonies of the 2014 Downriver Senior Olympics and most recently for the 2015 Taylor Farmer's Market sponsored by Oakwood Healthcare. The new splash pad site will be located to the south end of the center, off of the patio/fireplace. Part of the same phase will include the installation of a new huge playscape and decorative fencing around the area. Behind the Sheridan Center is a newly created asphalt pad, which will house an inline skating rink. That rink is currently at Northwest Park, but is underused there. As part of the current City tree installation program, the front of the center is being landscaped. 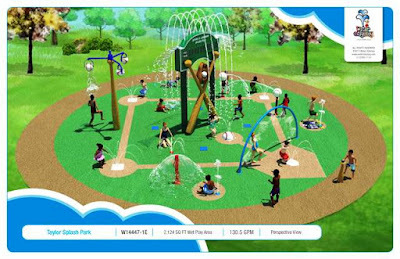 The new splash pad will be customized as a baseball diamond, thanks to Taylor's deep tradition of Little League baseball and also honoring the Junior League World Series, which is held in Heritage Park every year (and is currently being played there). It will feature a scoreboard, elevated baseballs, bases and base paths and much more. This phase of the project will be funded out of the buildings and grounds fund. The usage of those funds is restricted to things like construction and building improvements, and building debt. 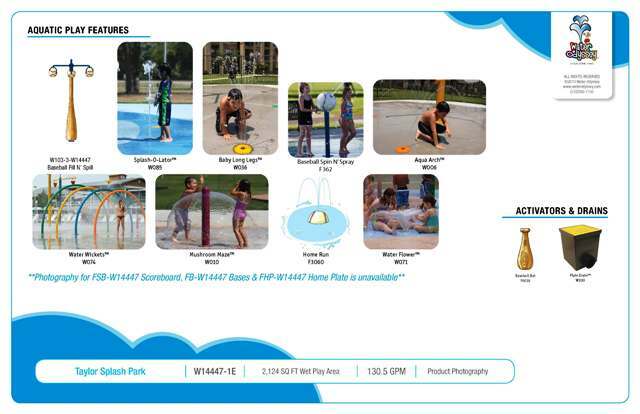 The splash pads will use a regular water feed -- the water will not be recycled within its system. Earlier designs of splash pads featured recycled water and some locations had difficulties with bacteria buildup and other such difficulties. This model should have not any of those problems. "When we are done with this, it should be a very nice fit to Heritage Park," Mayor Rick Sollars said. "Jeff started this process, so it makes plenty of sense to dedicate it to him. It was his vision, and we've continued to run with it and hopefully improve on it. When they customize this splash pad layout, I think our residents will really impressed." The former mayor was first elected to City Council in 2005. He served on the Planning Commission and the Master Plan Steering Committee, along with the Tax Increment Finance Authority and the Brownfield Redevelopment Board. He campaigned for mayor against then incumbent Cameron Priebe in 2009 and won a resounding victory, marking the first time that Priebe had ever been defeated in an election. During his only term in office, Mayor Lamarand faced financial difficult challenges as the City – like many other Michigan municipalities – lost more and more revenue. Eventually, Mayor Lamarand made large cuts to staffing in City government and instituted a State of Michigan-approved Deficit Elimination Plan. Current Mayor Sollars defeated then-Mayor Lamarand in the November 2013 General Election. Mr. Lamarand graduated in 1987 from the old Taylor Center High School and continued his education at Eastern Michigan University. Originally he planned to pursue a degree in Sports Medicine, but his path changed. Working his way through college, he completed his degree in Physical Education in 1996 along with minors in Marketing and Political Science. While job searching, he continued to work in the construction industry with his brother, Gary. In 1997, he decided to further advance his education and entered the graduate program for Public Administration at EMU. While studying at EMU, Mr. Lamarand began work with the Taylor School District as a substitute teacher and realized a passion for teaching. He completed his requirements while substitute teaching in Taylor and in 1999 was hired by the Crestwood School District in Dearborn Heights. While at Crestwood, he coached a variety of sports and spent nine years as the varsity softball coach. He also eventually completed his graduate degree in School Administration through Central Michigan University in 2003. On Saturday (August 22), the Asia-Pacific champions from Tai Chung, Chinese Taipei, will play the Puerto Rico national champions from Caguas for the International championship at 3 p.m.
At 6 p.m., USA Central Region champion Johnston, Iowa, will play Southeast Region champion Frederick County, Virginia, for the USA championship. The winners of those two games will play at 1 p.m. Sunday (August 23) for the ultimate prize: the world championship. This is the first time in the 35 years of the World Series that the final game will be played on a Sunday. The championship game of the World Series will be broadcast live by ESPN. Admission to Saturday’s games and the Sunday game is $5 per carload per day. Parking is included. The Junior League World Series is the international tournament for the best teams of 13- and 14-year-old baseball players. It’s the “older brother” of the more famous Little League World Series for 12-year-olds in Williamsport, Pennsylvania. The Junior League World Series has been held in Taylor since its inception in 1981. This is its 35th year. Teams win national and/or regional championships in tournaments around the globe to qualify for the weeklong international World Series. The four remaining teams emerged during round-robin pool play that took place this past Sunday through Thursday. Chinese Taipei (4-0) and Puerto Rico (3-1) placed first and second, respectively, in the International Pool. Iowa (4-0) and Virginia (2-2) earned the top two spots in the USA Pool. Virginia actually finished in a three-way tie for second with Ridgewood, New Jersey, and Pearl City, Hawaii. The teams remained tied after the first tie-breaker: head-to-head competition. The next tie-breaker – total defensive runs given up divided by the number of innings played on defense – is computed for each team involved in the tie. The team with the lowest run differential advances. As a result, Virginia qualified to play Iowa. Crossover consolation games are scheduled for today between the third-place teams from each pool (Panama vs. Hawaii), the fourth-place teams (Czech Republic vs. New Jersey) and the fifth-place teams (Canada vs. Texas). The annual Home Run Derby is scheduled for noon Saturday. Games on Saturday will be streamed on www.vaughnlive.tv/jlws. International Championship Game, 3 p.m.
USA Championship Game, 6 p.m.
Johnston, Iowa 9, Weslaco, Texas 5: The Central Region champions remained undefeated (4-0) and on top of the USA Pool by scoring eight unanswered runs to erase a 5-1 lead by the Southwest Region champs. After Texas scored four runs in the third, Iowa scored four runs in the sixth inning and the game remained tied at 5-5 after the regulation seven innings. In the top of the eighth, Iowa erupted for four more runs. Iowa’s Andrew Nord hit a three-run home run to tie up the game in the sixth, doubled in the first and hit a sacrifice fly in the eighth, knocking in four runs in all. Cade Moss went 2-for-3, scored twice and had an RBI. Adam Burns pitched two-hit ball the last 4 2/3 innings to earn the victory. Angel Castellanos had three of Texas’ six hits. The USA Southwest champs finished 0-4 in pool play. Tai Chung, Chinese Taipei 10, Oakville, Ontario 0: Huang Ching Yo and Gu Lin Ruei Yang combined on a six-inning one-hitter as the Asia-Pacific champions finished 4-0 in the International Pool. Chinese Taipei scored in five of the six innings before the 10-run mercy rule went into effect. Yo went 2-for3, scored two runs and had two RBI. Lee Cheng Ling was 2-for-3, scored once and knocked in a run. Nicolas Jaeggin had the lone hit for the Canadian national champions (0-4), a single in the second inning. No other Ontario player reached base. Chinese Taipei outscored its four opponents 45-7 in pool play. Caguas, Puerto Rico 10, Brno, Czech Republic 3: The national champions of Puerto Rico earned a spot in the International title game with a seven-run rally in the fifth inning. Puerto Rico had 11 hits. Lead-off hitter Kevin Bermudez went 2-for-3, scored a run and knocked in four runs. Hector Rodriguez went 2-for-3 and scored three runs. Yavier Caraballo went 2-for-2. For the champions of Europe and Africa, Tomas Chadim went 2-for-4 and scored twice and Lukas Hlouch knocked in three runs. Puerto Rico finished 3-1 in pool play. Czech Republic finished 1-3. Ridgewood, New Jersey 6, vs. Frederick County, Virginia 1: David Kleiman had three hits and Kevin Seitter pitched a three-hitter to lead the USA East champions to their second win of the World Series. New Jersey never trailed, taking a 1-0 lead in the second inning, adding two runs in each of the fourth and fifth innings and closing it out with a run in the sixth. Both teams finished pool play 2-2. Virginia emerged from a three-way tie (with New Jersey and Pearl City, Hawaii) to finish runner-up in the USA Pool after the World Series tie-breaking system was applied. The annual Home Run Derby is scheduled for noon Saturday on the Senior Field at Heritage Park. Players compete by hitting baseballs off a tee. The players who hit the most home runs win prizes. All players in the World Series are allowed to enter. The World Series operates on the generosity of sponsors, fundraising efforts and other donations, along with an all-volunteer staff. To make a tax-deductible donation or to become a series volunteer, contact Greg Bzura at (734) 306-3113 or bgregbz@att.net. For more information about the Junior League World Series, visit the website www.cityoftaylor.com/worldseries. Also, follow the World Series all year long on Facebook at www.facebook.com/juniorleagueworldseries and on Twitter at www.twitter.com/jlwstaylor. The official Instagram account of the World Series is @jlws_Taylor.